The elegance of an antique chair paired with the rustic tree table that actually compliment each other in similar colour family – and a zebra rug for a little shot of wild. 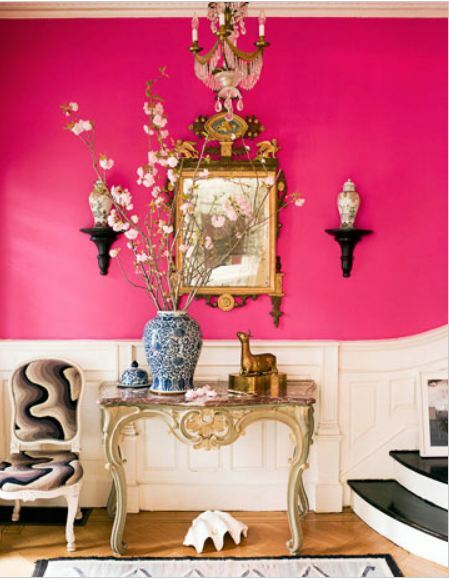 This pink is bold – and for an entrance why not? You may not want to look at this much vibrancy in your family room – but so fun and energic for a welcoming entrance. 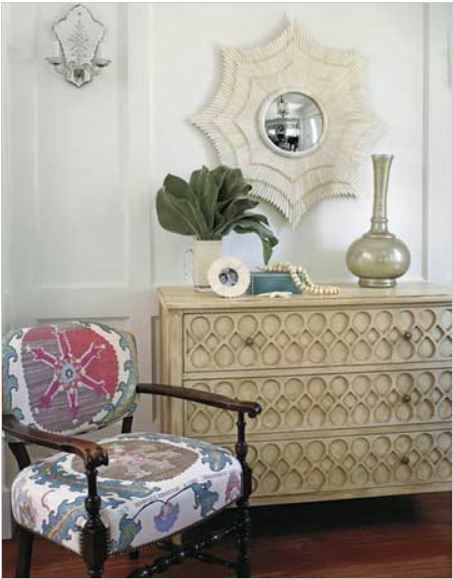 The white wainscotting keeps the pink from being overwhelming – and again a beautiful chair, console and accessories. Note the repetition of the black on the stairs in the chair fabric and on the wall sconces. Another pretty chair in a fun fabric, an intricate dresser is perfect for extra storage and WOW love that gorgeous mirror. Not all of us are blessed with this much space to work with – but an additional chair and a very large table are needed here to fill this volume of space. Large scale accessories are also needed. This is an interesting mix – the antiques, with the chrome table (Ikea had one similar) and how about the large foot under the table – a conversation starter! This is a perfect arrangement for a narrow space – a slim console, a lucite bench and the pair of lamps are great – some height and light – also adds symmetry. Fun leopard rug. This home is blessed with a lovely niche and has been taken full advantage of by the arrangement of furniture and accessories to fill it perfectly…. simple but a nice spot to have by the front door. So you only have room for 1 chair – does this inspire you to add some drama? 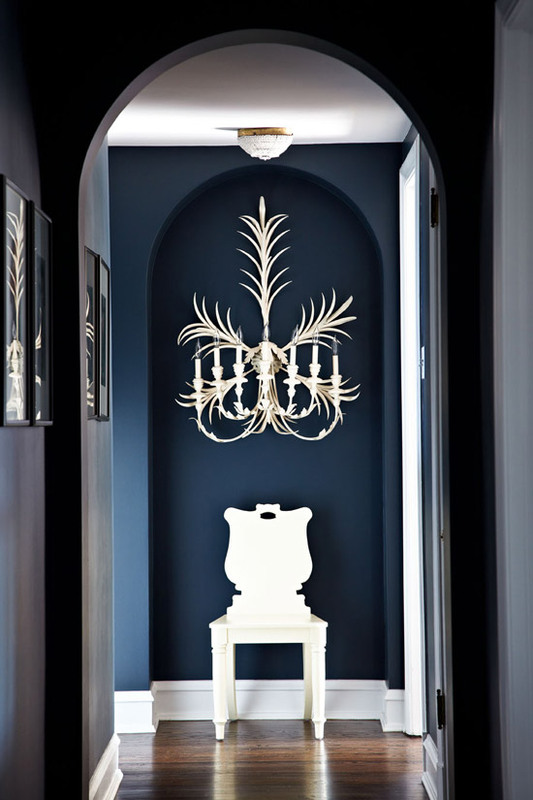 The dark navy/indigo wall contrasting the the white chair and sculptural chandelier really shows off the shape and accentuates it. Space not wide enough for a chair? 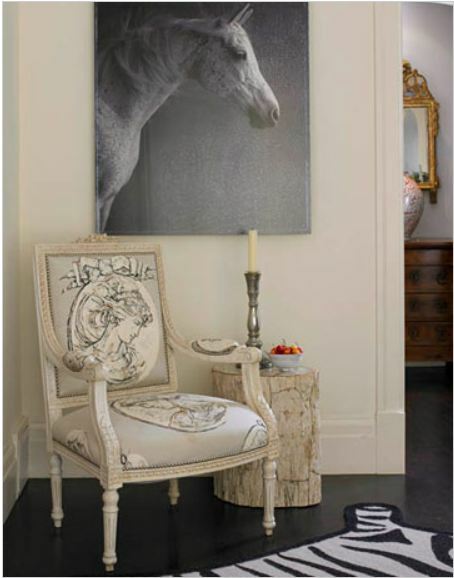 One antique shelf and stool plus some artwork – bet you can fit that in the smallest entrance. I hope you are inspired! My name is Sue Womersley and I love decorating. 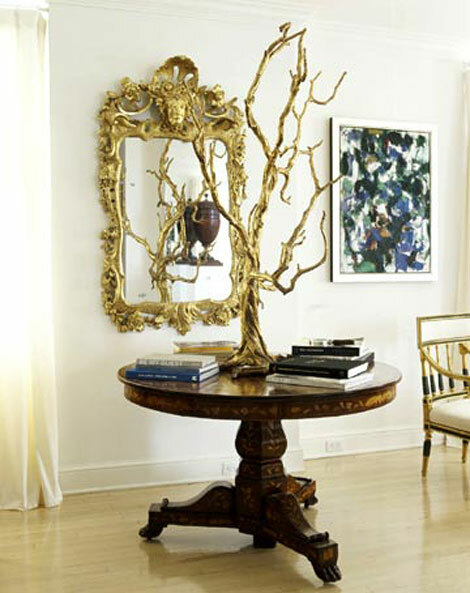 I am and Interior Decorator in Vancouver BC. great blog you have here Sue, lots of inspiration!